Journal of the House of Lords: Volume 13, 1675-1681. Originally published by His Majesty's Stationery Office, London, 1767-1830. DIE Sabbati, 7 die Decembris. Report when the King will be attended with Address. Message to H. C. to acquaint them. Popish Recusants to disable from exercising Trades, Bill. Information of a Nunnery at Ripley, in Yorkshire. Information of a Jesuits College at Combe, in Herefordshire. Stratford versus Cooling, in Error. Dowling, L. Bellasis' Servant, to be examined by L. C. Justice. Information against Capt. Spalding, to be enquired into. Preservation of the King's Person, and securing the Protestant Religion. Sir Ellis Leighton examined, and discharged upon Bail. Plunket, Leave to come from Ireland. Papers to be returned to the Clerk of the Council. Giffard, Penderell's, & al. to be exempted from Laws against Papists. Epus. St. David's. Dux Cumberland. The Lord Chamberlain reported, "That he hath waited on His Majesty, to know what Time He will please to appoint, for both Houses to present their Address; and His Majesty hath appointed this Afternoon, at Three of the Clock, in the Banqueting-house in Whitehall, for that Purpose." To acquaint them, that His Majesty hath appointed this Afternoon, at Three of the Clock, in the Banqueting-house at Whitehall, to receive the Address of both Houses. Hodie 2a vice lecta est Billa, "An Act disabling Popish Recusants to exercise certain Trades and Occupations." Epus. St. David's. Ds. Berkeley. Their Lordships, or any Five; to meet on Monday next, at Nine of the Clock in the Forenoon, in the Prince's Lodgings. Upon Information given to this House, "That at a Place called Ripley, in Yorkeshire, there is a Nunnery, wherein Women are educated in the Popish Religion:"
It is ORDERED, by the Lords Spiritual and Temporal in Parliament assembled, That it be, and is hereby, recommended to the Lord Archbishop of Yorke, to enquire into the Matter of the said Information, and to send for and examine such Persons as his Grace shall think fit, for finding out the Truth of the Matter of Fact; and if it prove so, to enquire why it hath been overseen so long; and to give this House a full Account thereof, so soon as his Grace with Conveniency can. Upon Information given to this House, of a Place in Herefordshire, called Combe, "That the said House and Three Hundred Pounds per Annum belongeth to the Church of Rome; and that Five or Six Jesuits commonly reside; and that in the Chapel there Mass is said constantly; and that the Place is commonly called and known by the Name of The Jesuits Colledge by the Papists:"
Upon Consideration had thereof, it is ORDERED, by the Lords Spiritual and Temporal in Parliament assembled, That it be, and is hereby, recommended to the Lord Bishop of Hereford, calling to his Assistance such Justices of the Peace of the said County as his Lordship shall think fit, to enquire into the Information aforesaid; and to send for and examine such Persons as his Lordship so assisted shall think necessary for finding out the Truth of the Matter of Fact, concerning the said Place called Combe; and to give this House a full Account thereof so soon as his Lordship with Conveniency can. Upon reading the Petition of Samuell Stratford; shewing, "That, having obtained a Verdict and Judgement in the Court of King's Bench, for Two Hundred and Two Pounds, besides Costs, against Joseph Cooling Esquire, Marshal of The King's Bench; which Judgement upon a Writ of Error is affirmed in the Exchequer Chamber; since which, the said Joseeph Cooling hath obtained a Writ of Error returnable into this Court, who ought thereupon to put in sufficient Bail to answer the Debt and Costs; instead whereof, he hath put in only one Mr. Wigg, an Under Officer of the Prison, who lives within the Rules thereof; the Petitioner therefore praying, that he may proceed to Execution, notwithstanding the said Writ of Error:"
Upon Consideration had thereof, it is ORDERED, by the Lords Spiritual and Temporal in Parliament assembled, That, in case the said Joseph Cooling shall not give Bail, within One Week next after Notice of this Order, by Two sufficient Persons, who are not Under Officers of The King' Bench Prison, nor live within the Rules thereof, for answering the said Debts and Costs, in case Judgement be affirmed in this Court, it shall and may be lawful for the said Samuell Stratford to proceed to take out Execution upon the said Judgement, as if no such Writ of Error had been granted returnable into this Court. The House being moved, "That the Lord Bellasis' Servant, Edward Dowling, who is now in Custody in The Gatehouse for Suspicion of Treason, may not be so discharged, but that he may be forthcoming at the Trials of the Peers now in Prison:"
It is ORDERED, by the Lords Spiritual and Temporal in Parliament assembled, That the Lord Chief Justice of England be, and is hereby, appointed to send for and examine the said Edward Dowling; and if his Lordship shall see Cause to give him any Liberty, he is to take good Security for the appearing of the said Edward Dowling at the said Trials. It is this Day ORDERED, That his Lordship (with such of the said Persons as upon due Summons shall appear) may enquire into the said Matters, and certify, as if it had been so expressed in the said Order. 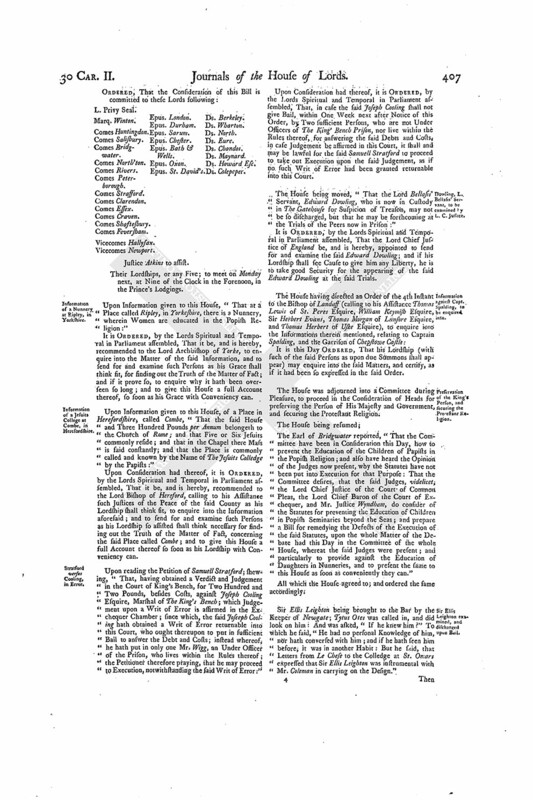 The House was adjourned into a Committee during Pleasure, to proceed in the Consideration of Heads for preserving the Person of His Majesty and Government, and securing the Protestant Religion. The Earl of Bridgwater reported, "That the Committee have been in Consideration this Day, how to prevent the Education of the Children of Papists in the Popish Religion; and also have heard the Opinion of the Judges now present, why the Statutes have not been put into Execution for that Purpose: That the Committee desires, that the said Judges, videlicet; the Lord Chief Justice of the Court of Common Pleas, the Lord Chief Baron of the Court of Exchequer, and Mr. Justice Wyndham, do consider of the Statutes for preventing the Education of Children in Popish Seminaries beyond the Seas; and prepare a Bill for remedying the Defects of the Execution of the said Statutes, upon the whole Matter of the Debate had this Day in the Committee of the whole House, whereat the said Judges were present; and particularly to provide against the Education of Daughters in Nunneries, and to present the same to this House as soon as conveniently they can." All which the House agreed to; and ordered the same accordingly. Sir Ellis Leighton being brought to the Bar by the Keeper of Newgate; Tytus Otes was called in, and did look on him: And was asked, "If he knew him?" To which he said, "He had no personal Knowledge of him, nor hath conversed with him; and if he hath seen him before; it was in another Habit: But he said, that Letters from Le Chese to the Colledge at St. Omars expressed that Sir Ellis Leighton was instrumental with Mr. Coleman in carrying on the Design." Then Sir Ellis Leighton said to this Effect: "That he being in France, when he intended to come for England with the Earl of Sunderland, came as soon as he was able (hearing of the Design), with Intent to serve His Majesty; that he never before now saw or heard of Tytus Otes. He said, he may be guilty of Indiscretion, but is not guilty of any ill Intention; that he hath lived in troublesome Times, but desires he may die in Peace." And so was ordered to withdraw. Upon Consideration had thereof, the House ORDERED, That Sir Ellis Leighton do presently enter into a Recognizance, to appear when he shall be required. Memorandum, quod Ellis Leighton Miles recognovit se debere Domino Regi Mille libras, Levari ex Terris, Tenementis, et Bonis et Catallis suis, ad Usum Domini Regis. The Condition of the abovesaid Recognizance is, "That if the said Sir Ellis Leighton Knight shall appear personally before the Lords in Parliament, when he shall be thereunto required by this House, then this his Recognizance to be void; otherwise to stand in full Force and Virtue." It is thereupon ORDERED, by the Lords Spiritual and Temporal in Parliament assembled, That the said Sir Ellis Leighton be, and is hereby, discharged from his present Imprisonment in Newgate; and this shall be a sufficient Warrant on that Behalf. To the Keeper of Newgate, his Deputy and Deputies, and every of them. Memorandum quod Walterus James Ar. recognovit se debere Domino Regi Mille Libras, Levari ex Terris, Tenementis, Bonis et Catallis suis, ad Usum Domini Regis. The Condition of the abovesaid Recognizance is, "That if the said Walter James shall appear personally before the Lords in Parliament, when he shall be thereunto required by this House, then this Recognizance to be void; otherwise to stand in full Force and Virtue." It is ORDERED, by the Lords Spiritual and Temporal in Parliament assembled, That the said Nicholas Plunkett be, and is hereby, authorized and permitted to come and stay in Town, for Ten Days next after his coming to Town, and no longer, for settling his Affairs here; and then to repair, with Two Servants, videlicet, James Plunkett and Edmond Leimagh to any of His Majesty's Sea Ports of this Kingdom, and to pass thence into the Kingdom of Ireland, without the Lett, Stay, or Interruption of any Person or Persons whatsoever: And this shall be a sufficient Warrant on that Behalf. 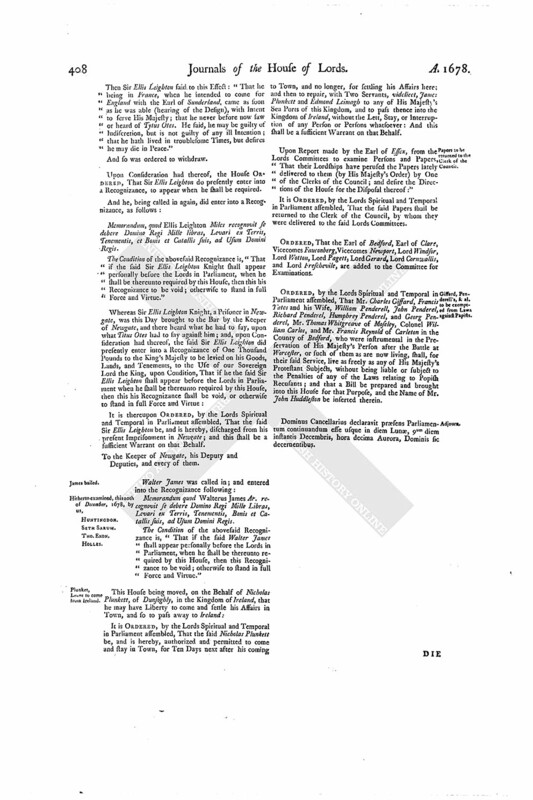 Upon Report made by the Earl of Essex, from the Lords Committees to examine Persons and Papers, "That their Lordships have perused the Papers lately delivered to them (by His Majesty's Order) by One of the Clerks of the Council; and desire the Directions of the House for the Disposal thereof:"
It is ORDERED, by the Lords Spiritual and Temporal in Parliament assembled, That the said Papers shall be returned to the Clerk of the Council, by whom they were delivered to the said Lords Committees. ORDERED, That the Earl of Bedford, Earl of Clare, Vicecomes Fauconberg, Vicecomes Newport, Lord Windsor, Lord Wotton, Lord Pagett, Lord Gerard, Lord Cornwallis, and Lord Freschevile, are added to the Committee for Examinations. 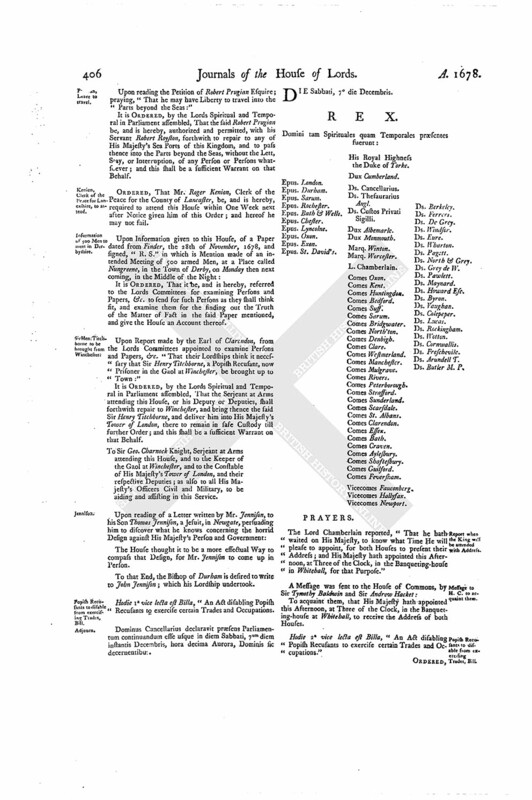 ORDERED, by the Lords Spiritual and Temporal in Parliament assembled, That Mr. Charles Giffard, Francis Yates and his Wife, William Penderell, John Penderel, Richard Penderel, Humphrey Penderel, and Georg Penderel, Mr. Thomas Whitgreave of Moseley, Colonel William Carlos, and Mr. Francis Reynold of Carleton in the County of Bedford, who were instrumental in the Preservation of His Majesty's Person after the Battle at Worcester, or such of them as are now living, shall, for their said Service, live as freely as any of His Majesty's Protestant Subjects, without being liable or subject to the Penalties of any of the Laws relating to Popish Recusants; and that a Bill be prepared and brought into this House for that Purpose, and the Name of Mr. John Huddleston be inserted therein. Dominus Cancellarius declaravit præsens Parliamentum continuandum esse usque in diem Lunæ, 9um diem instantis Decembris, hora decima Aurora, Dominis sic decernentibus.